A river of the same name formed the Nisqually Delta. As I hiked through the Wildlife Preserve, eventually I found myself at the shore of the river. All along the shore beautiful maple trees sparkled with the colors of fall--yellow, gold, and orange. A lovely day--a lovely adventure. 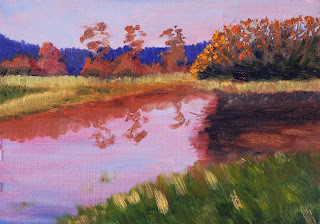 As I promised, here is another of my Nisqually Delta paintings. Somewhere in the vicinity of this delta was the original location of Fort Nisqually. The fort has since been rebuilt at Point Defiance Park in Tacoma, Washington, and as far as I can tell, there are no distinuguishing remnants of the original fort at this location. Today, a path traverses the prairie from the Nature Center to location of the signing of the Medicine Creek Treaty. Crossing the prairie toward this hostorical location, I noticed that many of the small scrub trees and the prairie grasses have turned from green to rust and gold. On the day I visited, there was a beautiful contrast between those colors and the blue of the fall sky. It was a delightful hike. 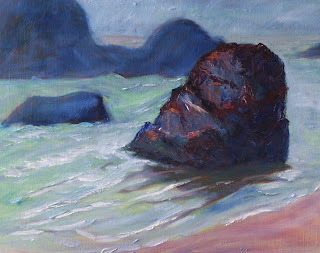 This little 5 x 7 oil painting is based on my adventure of a couple of weeks ago. I visited the Nisqually National Wildlife Preserve. It was an absolutely wonderful fall day with crisp air and sunshine. Hundreds of ducks and geese were passing through and stopping for a snack and a swim on their way to warmer climates. During the seven mile hike I snapped over a hundred photos. Besides myself, there were dozens of other photographers with impressive professional gear grabbing shots. I have been busy creating little rememberances ever since. I'll be posting them over the next few days. Incidently, this is my 201st posting in my Small Impressions Blog! If you haven't looked at some of my earlier work, I envite you to visit my archives and see what you missed. As fall takes over, my tendency to paint still life seems to increase. There are few weekend strolls and the weather doesn't entice me to leave my little studio. I paint more little gems such as this 8 x 10 still life. I started the painting with a value study incorporating only blue and red. 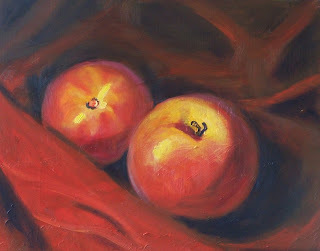 When it dried, I went back and added the yellow highlights on the peaches. Yesterday I finished up this little 6 x 8 oil painting on a recycled canvas board. 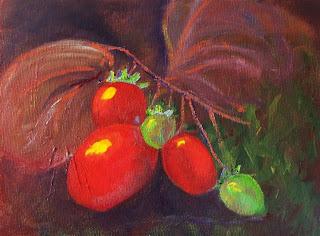 It is inspired by those last little tomatoes that hang on to the vine in the fall and by a song by the same name, "Hang on Little Tomato." Here are the lyrics. A band called Pink Martini performs the song on the album of the same name. If you haven't experienced their music, you are missing out. Go to the MOG website, to hear some clips from the the album. In addition to this one, they have two other released collections. Nothing beats listening to Pink Martini and painting! This 8 x 10 oil painting is one I did some time ago. It has gone through several transformations in its short life time. It began as an experiment with underpainting of cadmium orange. Adding several layers of warmth gave it a very tropical feeling. The water develped an light aqua tinge. The entire painting felt foreign to my sensibilities. Living in the Pacific Northwest provides few opportunities to experience tropical waters and sunny, warm rocks. After the painting dried, I changed the mood again. Creating a foggy, cool environment felt more natural. The contrast between the water and the skyline almost disappeared as it does when banks of rain clouds and mist drift across the water's surface. Darkening the rock and adding a cool blue scrumble brought the temperature down considerably. Whether I liked the results or not was ambiguous, so I put it in the closet to dry. I often send paintings of questionable behavior to the closet. After its stint in solitary, I took another look and decided it was time to present it to the world and quit fiddling. This little 5 x 7 was a quick oil painting I completed about a week ago. I was working on painting shapes instead of "things," a technique recommended by Charles Hawthorne in his book Hawthorne on Painting, first published in 1938. It is an interesting approach because one has to drop the idea of a tree, a path, or a road ad think only about shape and color instead. I enjoyed the process and am satisfied with the results as well. This morning I ran across this photo on Flickr. I seldom use photos other than my own, but I couldn't resist asking the owner for permission to paint it. He kindly gave permission and asked only that I provide a link to his photo, so please take a look at the original. 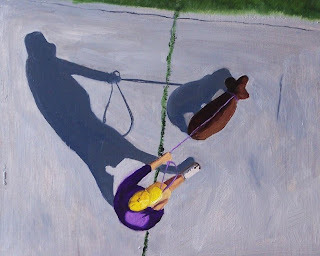 This painting is the second in my series of aerial perspective paintings. Here is the first. Both are 8 x 10 oil on gessoed hardboard, and both were just plain fun to paint. I am looking forward to adding to the collection. The weekend has finally arrived. Rain is not predicted, and I'm looking forward to getting out, enjoying what is left of the green fields of summer. 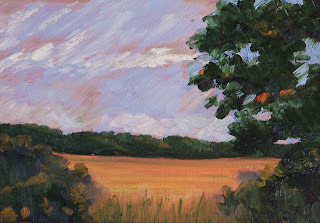 This 8 x 10 oil painting comes from my memory of those fields. As if the rain and drizzle were not enough, a nasty storm is predicted for this evening. I'm keeping my chin up and working with my brightest pallette. 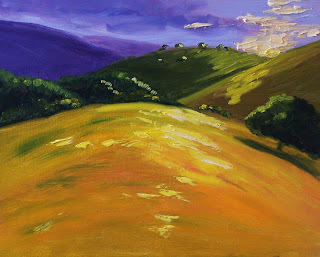 Creating this 8 x 10 oil painted hillside sunset definitely helps. My imagination took off with the sunny warmth--longing for summer days again. Autumn is here. I have to accept it. Rainy and gray again today, but I'm sticking with the color. 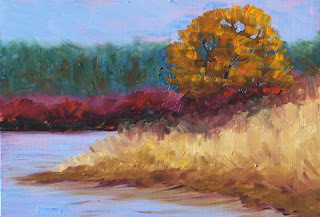 The inspiration for this 8 x 10 oil painting comes from my longing for those sunny fall days that seem to be behind us, at least here in Western Washington. 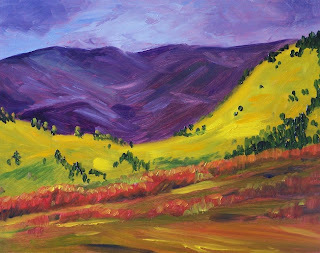 The Cascade Mountains in Northeastern Washington generate gorgeous fall days such as the one in this painting, but I can only imagine as I sit in my studio and look at the gusting wind and drizzle. 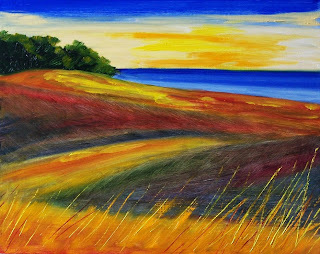 Because it feels like the sky is endlessly gray and the rain just keeps drizzling, I painted this bright little 8 x 10 sunset. 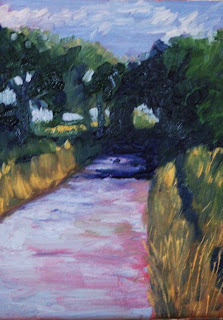 The weather has been overcast for a week and the report is for at least another week of it, so it is sunny little oil paintings like this that keep me happy. 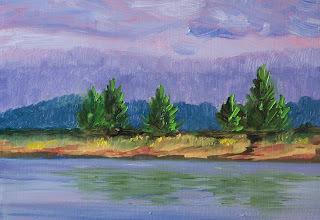 The Columbia River at Astoria, Wasington is the inspiration for this little 5 x 7 oil painting. Several weeks ago as I returned from the Oregon coast, this scene grabbed my attention. Rain clouds were approaching, but there was enough late afternoon sunlight to create a reflection and make the grass on the shoreline sparkle. 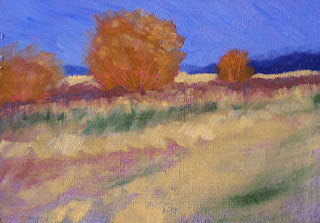 As fall arrives, the first natural element to change color is the grassy fields. 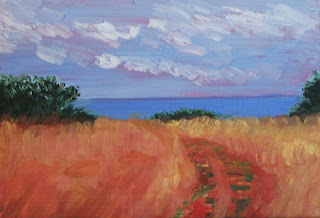 This little 5 x 7 oil painting on a gessoed hardboard was inspired by a road trip I took this weekend. 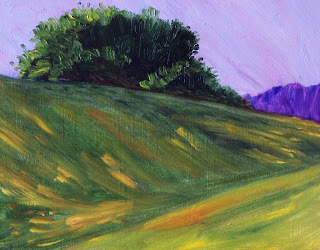 As I passed by field after field, I noticed that there is still green foliage, but the fields are brown and colorful leaves are beginning to appear on the trees and shrubbery.